From Tamashii Nations. The third release of the TV series EVA units in cutting-edge NXEDGE STYLE is the Evangelion EVA-02 with an all new head sculpt! Includes an optional head to re-create 'awakened' mode, and even an AT field! Weapons include the sonic glaive and prog knife with distinctive TV series sculpting. 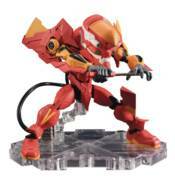 Now you can re-create the classic 'synchro' scene with Shinji's EVA-01 (sold separately!) The set also includes a stand. NEON GENESIS EVANGELION VOL. 04 2ND ED. NEON GENESIS EVANGELION VOL. 07 2ND ED. NEON GENESIS EVANGELION VOL.01 (3-IN-1 ED.) NEON GENESIS EVANGELION VOL.01 2ND ED. NEON GENESIS EVANGELION VOL.04 (3-IN-1 ED.) NEON GENESIS EVANGELION VOL.05 2ND ED. NEON GENESIS EVANGELION PRODUCTION MODEL CUSTOM TYPE-08' NEON GENESIS EVANGELION PRODUCTION MODEL TYPE-02'?